A recently released case report, courtesy of the BMJ, reaffirms one of life’s important lessons: Don’t try to hold back a sneeze. Especially, don’t do it by plugging up your nose and mouth—you just might end up in the emergency room with a gaping hole in your throat. 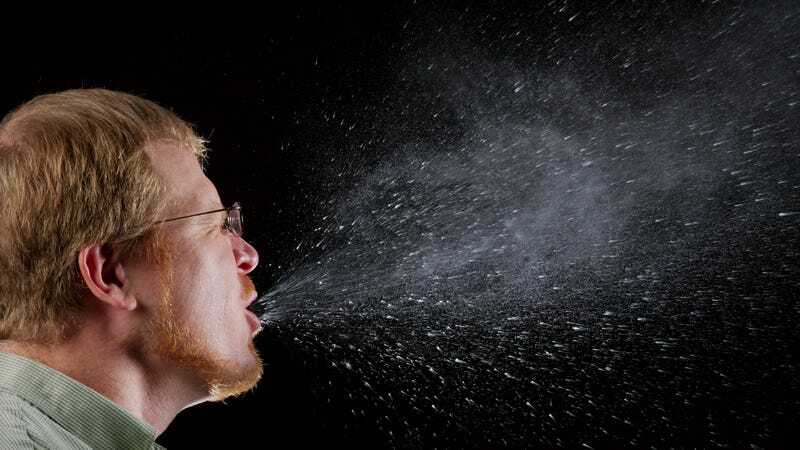 The report details an otherwise healthy 34-year-old man in the UK who felt a popping, painful sensation in his throat immediately following a sneeze he had tried to stop by sealing off his mouth and nose. By the time the man made it to the ER, he had lost his voice and was barely able to swallow. When doctors first examined him, they also heard crackling sounds that ran from his neck all the way down to the ribcage. Subsequent imaging tests found that the force of the man’s inward sneeze inadvertently punctured his pharynx, the section of the throat behind the mouth and nose found before the esophagus and larynx. The crackling, popping sensation was a condition known as crepitus, seemingly caused by air bubbles that had seeped into and rubbed against the soft tissues of his neck and the space between his lungs via the hole. Because he was at high risk of a deep neck and chest infection, the man was admitted to the hospital, put on a feeding tube, and given cautionary antibiotics. Thankfully the man did recover. By day 7, his throat had healed enough that he was taken off the feeding tube and soon after discharged from the hospital—with instructions to avoid holding in his sneezes. A subsequent check-up two months later revealed no further problems. Again, as the doctors write, these cases are extreme oddities, so you shouldn’t be too worried. On the other hand, of all the ways we could shuffle off this mortal coil, death by blocked sneezing has surely got to be one of the most embarrassing. So probably best to just play it safe and keep a tissue or at least the inside of your arm handy whenever you feel a tickle in your nose.